Today begins my 3 day juice cleanse aka my “spring cleaning.” I haven’t been feeling very well lately and was battling a sinus infection, acid reflux, and major GI issues. I went on antibiotics last week and I’m starting to feel much better. Now I am doing a 3 day juice cleanse to essentially “clean me out” so I can heal my digestive tract and start fresh. I know juice cleanses are very popular right now with new juiceries and cleanse programs popping up all over the place. 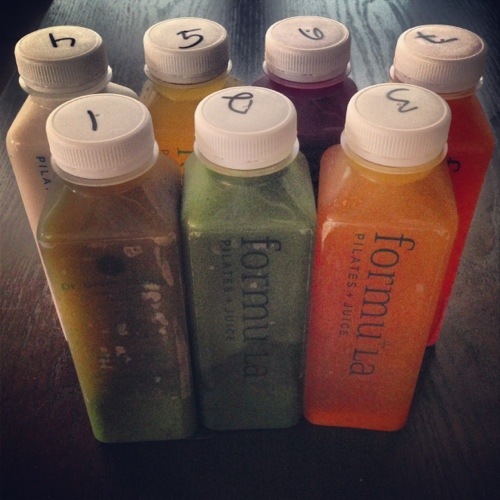 There is a new pilates studio and juicery called Formula that just opened in Manhattan Beach and I’ve decided to try them out for my cleanse this time around I am planning to post daily updates on how it goes so keep checking back! Update: Since my juice cleanse is over I decided to include links to my recaps so you can check them out. Read and enjoy! This is an instant download PDF e-book. I have also decided that I am going to begin a 21 Day Sugar Detox after my 3 day juice cleanse is complete. The 21 Day Sugar Detox is a program that was written by Diane SanFilippo of BalancedBites.com. She also wrote a book called Practical Paleo that is one of my favorite books on the paleo diet. She has an e-book out called the 21 Day Sugar Detox which helps to detox and fight cravings. I purchased the 21 Day Sugar Detox e-book several weeks ago and it’s chalk full of great information, recipes, and charts. I heard Diane SanFilippo is also turning the 21 Day Sugar Detox e-book into a published book this Fall. Pretty awesome. I’ve decided that my 21 Day Sugar Detox is going to begin on Monday May 20th. I am inviting all Fit & Awesome friends and readers to participate and join me. 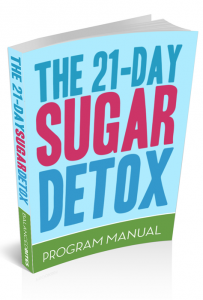 1) Download the 21 Day Sugar Detox guidebook. It’s a 90 page PDF e-book with 3 different custom plans based on your needs and goals. It’s also got recipes and food ideas. I will be posting recipes on Fit & Awesome when I find good ones as well. If you already know what to eat then you probably don’t need the guidebook but I think it’s got a lot of good information. 2) Email / Tweet Me / Facebook me and let me know you plan on participating. Or just post in the comments below and let me know. I am going to be posting special updates to those who participate with me so let me know if you want in on this. Get excited. This is going to be awesome. Juice Cleanse Day One Recap coming tomorrow!